MAGNE HEGDAL (b.1944): Concert Piece in three sections for Piano and Orchestra, Songs and Flowers (Annotations VIII-XVII) for Piano, ANTONÍN REICHA (1770-1836): Practische Beispiele Nos. 3 and 23 for Piano. Description: In the 1970s Hegdal started to base his works on aleatoric principles, and the balance between chance and predetermined structure has been an important characteristic of his work ever since. The recent Concert Piece, we are informed by the almost unprecedentedly unhelpful (in proportion to their length at any rate) booklet notes, is the first of the composer's large-scale mature works not based on aleatoric methods, but apparently there are elements of chance and performer choice within a structure designed to provide a formal outline and then remove the composer's choices from the equation. What you actually hear is a far from unapproachable piano concerto in which an abundance of classical and romantic motifs (including some literally and recognisably borrowed from Mozart, Beethoven and Reicha (which is why the latter makes a cameo appearance on the disc)) are integrated into a kind of collage in which the interstices are occupied by Hegdal's less tonal cement. The piano suite Songs and Flowers similarly comments on previous music, much of it apparently Hegdal's own, with allusions to other composers. Less of this piece is tonal, but the short movements are very diverse, some being far more tonality-based than others. 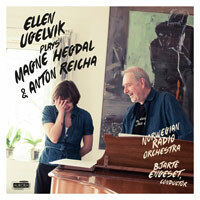 Ellen Ugelvik (piano), Norwegian Radio Orchestra; Bjarte Engeset.